Objective: Deep sea water (DSW) accumulates many scientific shreds of evidence in treating obesity. Previous studies indicated that it reduces white adipose tissue (WAT) and body weight. WAT is energy storage fat, while beige adipose tissue is energy supply fat. 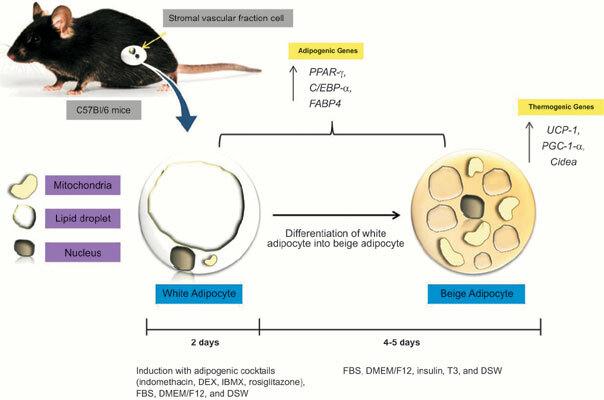 In this study, the effects of DSW in the induction of beige adipocytes from mouse adipose tissue-derived stromal vascular fraction (SVF) cells are determined. Methods: Adipose tissue-derived SVF cells were isolated from mice and used for induction of beige adipocytes and treated with DSW at several concentrations. Results: During the course of beige adipocytes differentiation, DSW treatment increased lipid accumulation and upregulated adipogenic genes markers expression such as peroxisome proliferator-activated receptor-γ (PPAR-γ), CCAAT/enhancer-binding protein a (C/EBP-α), and fatty acid binding protein 4 (FABP4), and also upregulated thermogenic genes markers such as the uncoupling protein 1 (UCP-1), peroxisome proliferator-activated receptor gamma coactivator 1-alpha (PGC-1α), and cell deathinducing DFFA-like effector A (Cidea) in beige adipocytes. Conclusion: DSW has the potential to promote browning of WAT and upregulates the thermogenic genes that are responsible for energy expenditure. Deep sea water, beige, browning, obesity, thermogenesis, anti-obesity.